1. Crinkle metal: If you love reticulation, this is an easy way to achieve the same effect. The metal reticulates as soon as it is brought up to temperature and can be formed first as it will hold its shape. 2. Charcoal block: Great for granulation because of its super smooth surface meaning the little balls of metal you make won't stick to the block. 3. 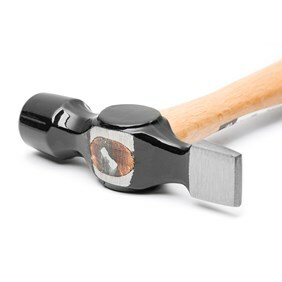 Ball pein hammer: Ideal for making a traditional hammered texture on metal. Use with a steel block. 4. 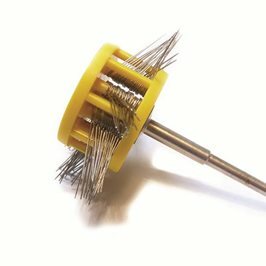 Glass fibre scratch brush: While useful for cleaning and preparing metals before polishing, it is also great for applying a matt or brushed finish to metals. 5. Cross pein hammer: Useful for creating a bark like texture on metal. Use with a steel block. 6. Satin texture wheels: Also known as flick mops or frosting wheels, these texture wheels will give your metal a wonderful, permanent satin finish. Available in fine and coarse. 7. 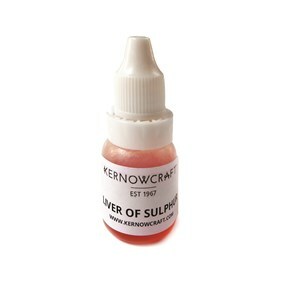 Liver of sulphur: Use it to achieve an antique, black or iridescent coloured patina on silver, copper, bronze, brass, gold and metal clays. 8. Patina Basics DVD: This DVD is easy to follow and will take you through some great techniques using household products to achieve colour on metals. 9. Scriber: A good quality scriber is an essential tool for all silversmiths making score marks on sheet metal, but it is also great for making a dotted texture on metal when hammered gently. Marks are revealed with liver of sulphur. 10. Gravers. 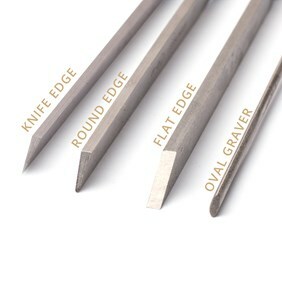 Available in different shapes, these gravers can be used for engraving pattern, marks and texture into metals. Make them more comfortable to hold with a wooden graver handle. If you'd like a full range of tools for texturing metal, why not build your own tool kit? We have our full range of suggestions to make your own metal texturing kit on our Build A Tool Kit page where you have the ability to select all of our suggestions or simply the ones you don't have already.